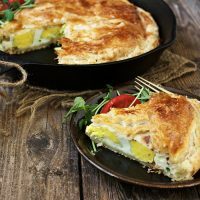 This easy and delicious bacon and egg pie is perfect for breakfast, brunch or dinner. Uses store-bought puff pastry, so it's quick to put together. You can assemble this pie ahead, cover and refrigerate and then bake when you're ready. Generously great a cast iron skillet or round baking pan (8-10 inches diameter or square) and pre-heat oven to 400 F.
On a floured surface, roll out 2/3 of the puff pastry into a round or square big enough to cover the bottom of your skillet/pan and to come about 3/4 of the way up the sides. Scatter green onion over the bottom of the pastry and then scatter 1/2 of the cooked, diced bacon. Carefully break the 8 eggs on top, spacing them evenly around the outside and then one last one in the middle. Season generously with salt and pepper. then scatter on the remaining bacon. Roll out the remaining 1/3 of the pastry to make a lid. Crimp the pastry edges together with a fork and trim off any excess. Use the trimmings to decorate the pie if you wish (attach them with a dab of egg wash). Cut four small vents in the pastry lid with a sharp knife. Brush with beaten egg mix and bake 35 - 40 minutes until rich golden brown and crispy.